Ross County defender Tom Grivosti will know what to expect if he comes up against on-form Queen of the South attacker Stephen Dobbie on Saturday. 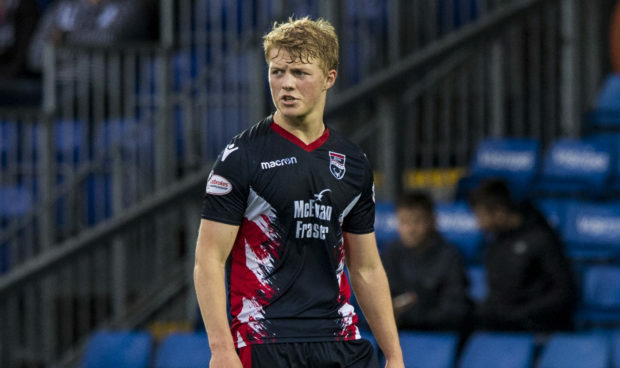 Englishman Grivosti has broken into the Staggies team in recent weeks, and made his first Championship start in last weekend’s 1-0 victory over Alloa Athletic. The 19-year-old joined County’s Development squad in 2017 having been released from the youth ranks of Bolton Wanderers, where he had been since the age of 12. During his stint with the Trotters, a 16-year-old Grivosti came up against Dobbie in training when the veteran attacker spent the 2015-16 campaign with the Lancashire club. Should he get the nod from co-managers Stuart Kettlewell and Steven Ferguson, Grivosti is under no illusions about the threat he faces in the form of 36-year-old Dobbie, who has already netted 29 goals for Queens this season. Grivosti said: “I trained with Stephen Dobbie a few times when I was at Bolton Wanderers and he was there too, so I have a clear idea of what I’m coming up against. “He is one of the top strikers in the league so it will be a great challenge for me, if I play. “I was quite young, to be fair, so only worked with him a couple of times. Personally, I don’t know him that well. “But his goals speak for themselves. He has scored some amount this season and I know he holds a lot of quality. Grivosti’s only two appearances prior to Saturday’s win at Recreation Park were a substitute outing in a 2-1 home win against Ayr United and a start in the recent IRN-BRU Cup quarter-final win over Motherwell colts. Liverpool-born Grivosti feels he is already reaping the benefits of his exposure to first team football, adding: “I was very nervous when I came on for my debut in the second half against Ayr United, but any player making their first appearance would have felt the nerves. “But I think I handled the nerves well and did all right in that game. That’s helped me go on and start matches. I haven’t felt half as nervous since. “I’m learning so much at the moment from the likes of Marcus Fraser, Ross Draper and Keith Watson who are all in around me defensively. Even on the training pitch every day, themanagers are helping me keep learning. “That’s what you want as a young centre-back. You can never stop learning how to defend better. “The main difference is concentration levels. You have to focus 100% of the time on the pitch.